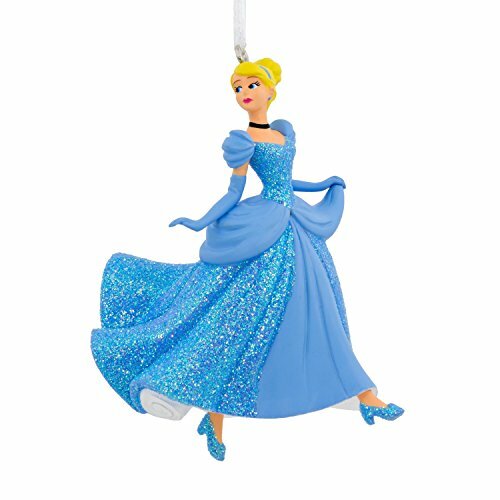 Bring the magic of the animated Disney classic “Cinderella” to your Christmas tree year after year. She’s a vision of beauty in her blue ball gown with glittery accents. And best of all, she won’t have to hurry away when the clock strikes midnight. Hallmark Christmas Ornaments celebrate characters from contemporary and classic movies, TV shows, toys and entertainment. Made of polyresin, this Hallmark Ornament measures 2.5 x 3 x 2.1 inches and comes in a 3.5 x 4.7 x 2.5 gift box. The ornament is ready to hang on your Christmas tree with a ribbon hanger. Perfect gift for fans of fairy tales and Disney Princess Cinderella. Each piece includes one Disney Cinderella Christmas Ornament in a gift-ready box. Hallmark Christmas Ornaments are a great way to commemorate individual interests and those that you share with family and friends. Hallmark has been your family-owned creator of greeting cards, gifts, gift wrap and more for over 100 years. We take deep pride in helping individuals connect in just the right way. This Hallmark Christmas Ornament is lead-free. Bring the magic of the animated Disney classic “Cinderella” to your Christmas tree year after year. She’s a vision of beauty in her blue ball gown with glittery accents. Made of polyresin, this Hallmark Ornament measures 2.5 x 3 x 2.1 inches and comes in a 3.5 x 4.7 x 2.5 gift box. The ornament is ready to hang on your Christmas tree with a ribbon hanger. Each piece includes one Disney Cinderella Christmas Ornament in a gift-ready box. Perfect gift for fans of fairy tales and Disney Princess Cinderella.